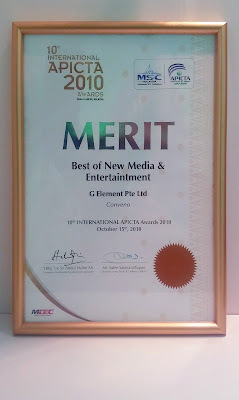 Conveno has successfully won the Merit Award under the category of New Media and Entertainment at the Asia-Pacific ICT Awards 2010, held at Kuala Lumpur, Malaysia on 15 Oct 2010. The Asia-Pacific ICT Awards is a prestigious, annually held ICT event widely regarded as the 'Oscars' of the ICT area in the Asia-Pacific region. The Merit Award represents a strong accolade and recognition of Conveno and its potential. We thank our partners and clients for your strong support in this success!